Usage: Cutting compound for stainless steel, aluminium and aluminium alloys. Different metals have varying characteristics. To achieve the best possible result, it is essential that the correct compound and polishing buff is selected for the job. 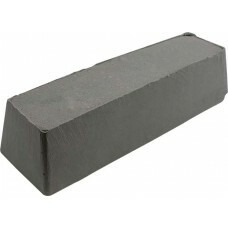 The cutting compound should be used on a Sisal buff or stitched buff. A white stitched buff is ideal for cutting into metals. With the correct compound it will remove stretcher strains, orange peel, polishing wheel grit lines, light die marks etc. An unstitched buff is used with polishing (finishing) compound on metals. Each fold/leaf of material is approximately 1mm thick. TCBF150-2C DENIM 30mm Ø150mm 2 Ø1/2"
TCBF150-3C DENIM 30mm Ø150mm 3 Ø1/2"
TCBF200-2C DENIM 20mm Ø200mm 2 Ø1/2"
TCBF100-2W COTTON 20mm Ø100mm 2 Ø1/2"
TCBF150-2W COTTON 20mm Ø150mm 2 Ø1/2"
TCBF150-3W COTTON 30mm Ø150mm 3 Ø1/2"
TCBF200-2W COTTON 20mm Ø200mm 2 Ø1/2"
TCBF200-3W COTTON 30mm Ø200mm 3 Ø1/2"
TCBF10030 Buffing wheel kit Ø100mm Cotton, Denim & Sisal Ø1/2"
TCBF15030 Buffing wheel kit Ø150mm Cotton, Denim & Sisal Ø1/2"
TCBF150-50W COTTON Ø150mm 50 Ø1/2"
TCBF200-50W COTTON Ø200mm 50 Ø1/2"
Colour (denim) buffs are coarser than white (cotton) buffs.